Rose bush plants come in containers, with fully developed root systems, or as bare-root plants, in boxes of peat to keep them moist. When you plant the rose bush in hardiness zone 8 depends on which type it is. Bare-root roses can be planted in January in zone 8. USDA hardiness zone 8a has lows of 10 to 15 degrees Fahrenheit, and USDA hardiness zone 8b has lows of 15 to 20 degrees Fahrenheit. An example of a city in zone 8a is Dallas, Texas. Gainesville, Florida, is in zone 8b. Most roses are rated with a minimum zone of cold hardiness. For instance, a rose plant hardy to USDA zone 3 can withstand temperatures as low as -40 degrees Fahrenheit. Rose plants listed for USDA hardiness zone 8 can not withstand severe temperatures but do well in extreme heat. 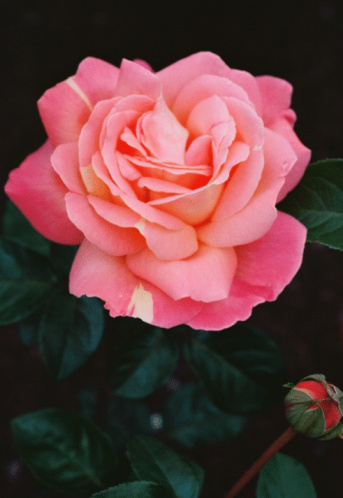 Rose bushes should be planted when the soil is cool and moist. In regions within USDA hardiness zone 8, January is the best time to plant bare-root rose plants. Containerized rose plants, which have more developed root systems, can be planted year-round.